We got the bounce I was looking for, but it came later and after more damage then I expected. The ramp job that occurred at Friday’s close was undone in the futures by the time the cash market opened. I expected 1298.60 to hold, as it was key to the most bullish wave count out there — that we’re completing a minor 4 and beginning minor 5 up. We did get several bounces off 1298.60, coming with 7 cents at 7:57 and 2 cents at 8:38AM. At that point, we were within spitting distance of the falling wedge bottom TL and the .382 Fib line. But, here, the selling pressure intensified and we bottomed at 1295.92 before retracing back to 1305.44 at the close. The minor 4 count isn’t the only bullish count. For great charts and discussion, check out the excellent Daneric’s Elliott Waves blog. And, to be clear, I don’t expect the bullish case to play out. But, I am surprised that those with a bullish agenda let this important line in the sand fall so easily. My hindsight is that it was in their best interests to throw a scare at the Congress and Administration in order to get a deal done on the debt ceiling. The Goldman’s, Merrill’s and JP Morgan’s of the world have huge stakes in seeing that the market remains “healthy.” Underwriting, M&A;, trading, investment management, etc. all depend on a continuation of markets that are worth investing in. A default by the US would destroy these revenue streams in a heartbeat. I believe, therefore, that the powers that be orchestrated today’s little sampling of bear meat for the benefit of those Congressional dimwits (redundant, I know) still clinging to the idea that we could survive a default. For that reason, the comeback at the EOD wasn’t allowed to accelerate the way it normally does — remaining, instead, firmly in the danger zone and keeping everyone more than a little on edge. VIX completed the backtest of the rising wedge it fell out of Friday, should head down from here. SPX down 14.62 to 1301.52. For all the fear raging through the market, we’re still only at the bottom of the falling wedge and the -1 std dev line (also the .382 Fib) is holding just fine. Don’t think we’ll broach the 1258.60 mark. Took some short profits and added some on the long side here. Going back and forth on the upside target. Leading candidates right now are 1327-1330 (channel midline and .618 Fib) and 1346.50 (.786 Fib.) 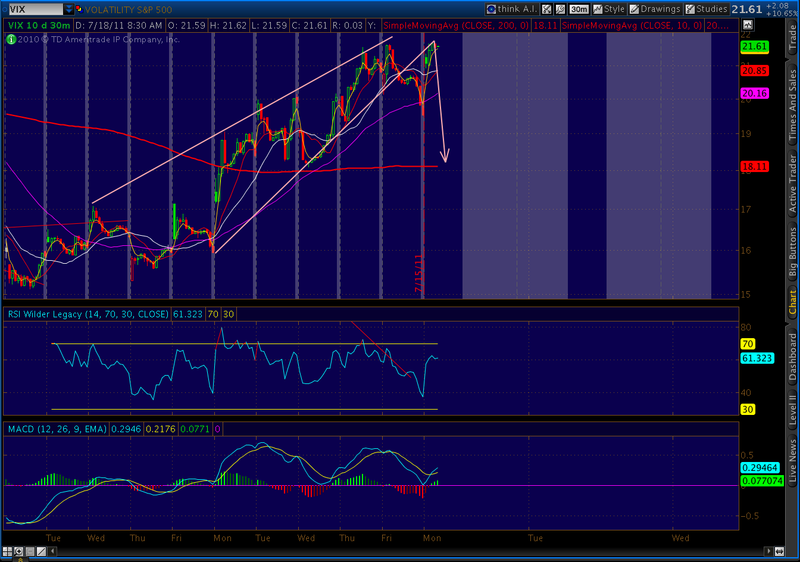 TL off the May 2 high currently at 1350, but if we include shadows it changes to 1354. 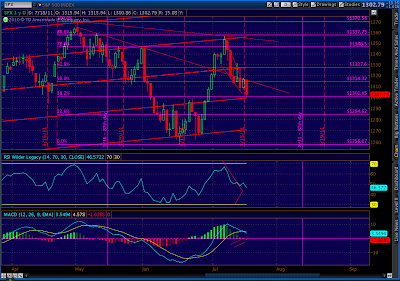 I don’t think we’ll break the Jul 7 high of 1356.48. 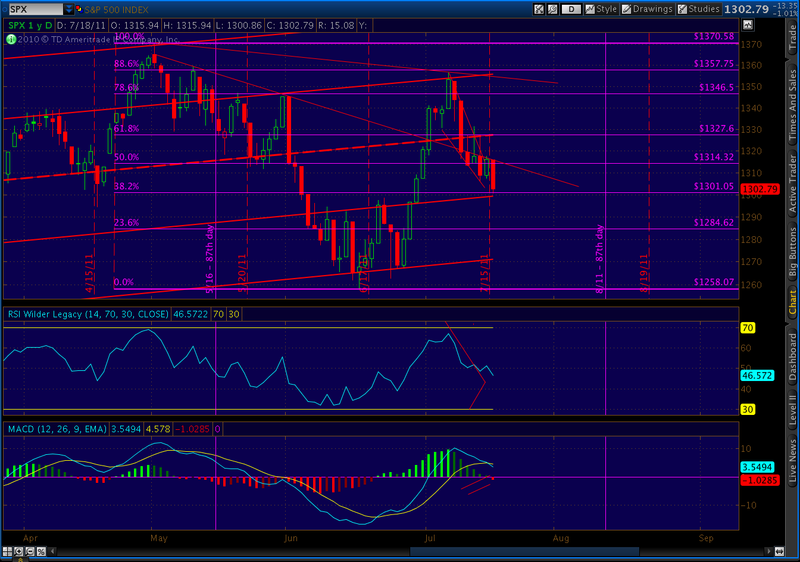 The downside should be limited to the -1 standard deviation regression channel line, currently around 1300. All subject to the debt ceiling talks, of course. Still looking for a countertrend rally up to the 1345 area beginning this morning, all totally subject to the debt ceiling news, of course. Geithner trying to calm the markets with assurances that the ceiling will be raised — kind of like Hannibal Lechter assuring a dinner guest that there’s plenty of food to go around.